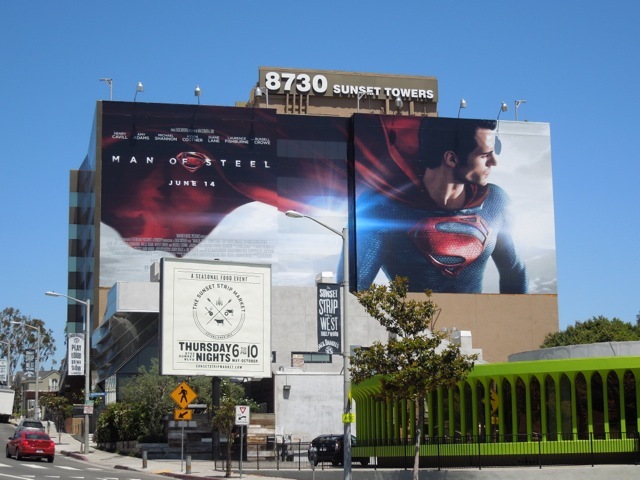 There's a new Man of Steel in town and Warner Bros. Studios really want you to know about it as Superman dominates the L.A. skyline at the moment. 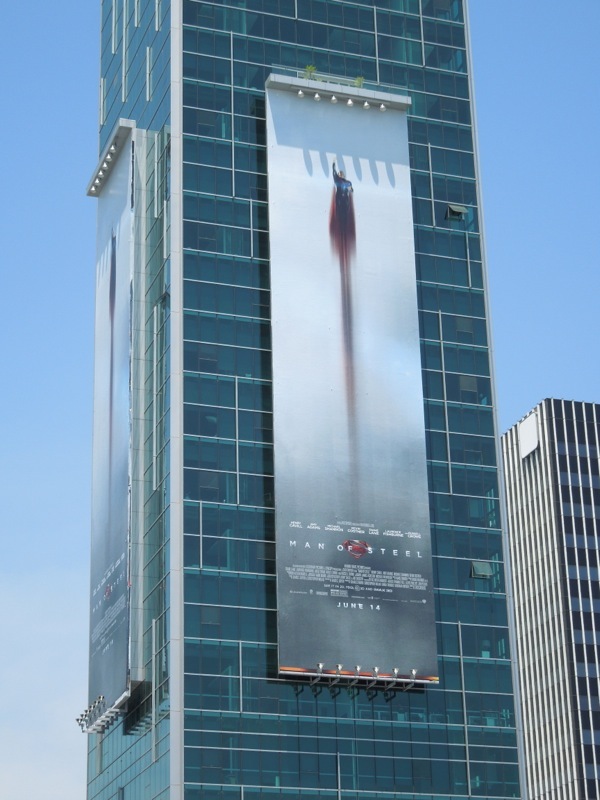 For the first Superman movie starring Christopher Reeve in 1978 the advertising tagline was 'You'll believe a man can fly' and with these new creatives for Man of Steel, Daily Billboard honestly believes it as it really does look like he's rocketing through the sky. 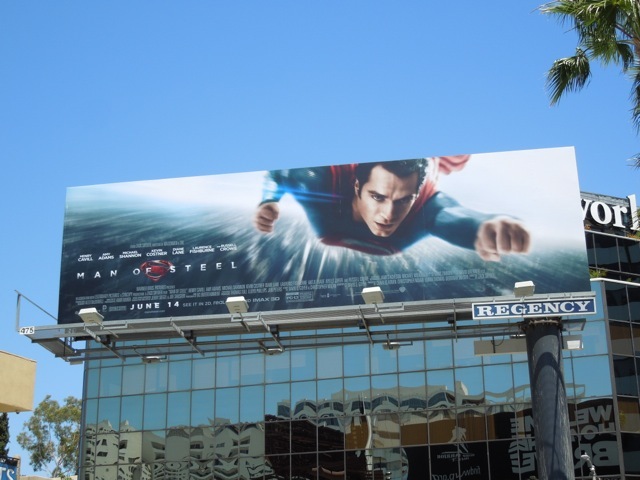 Even though we've seen another Son of Krypton more recently in Bryan Singer's 2006 Superman Returns (Brandon Routh), these 2013 creatives featuring Henry Cavill still feel fresh, new and most importantly, exciting. 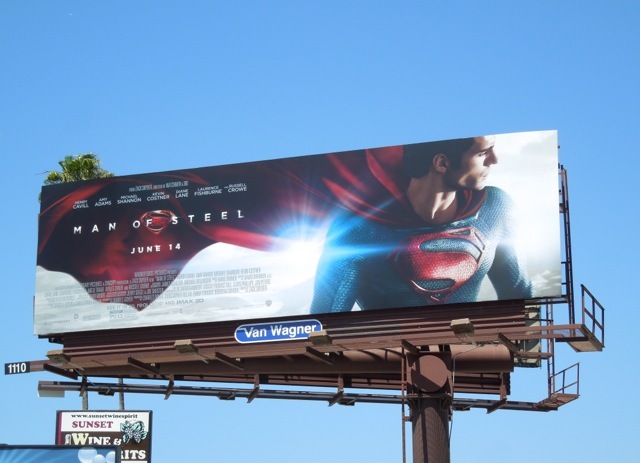 The ad creatives also give the DC Comics character an epic and heroic quality and evoke that sense of awe you look for in a superhero movie. 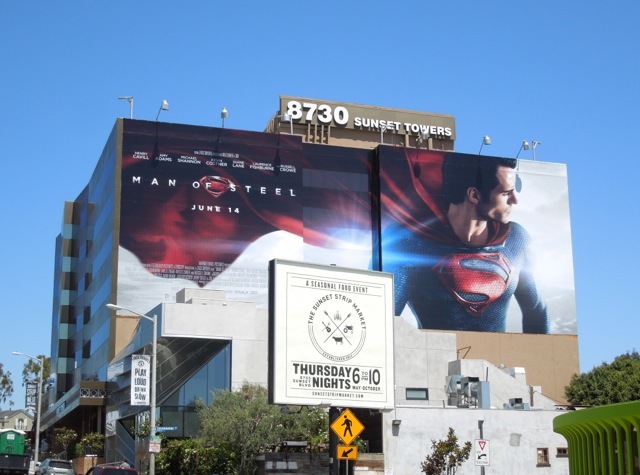 Only time will tell if Henry Cavill can be a leading man on the big screen, although by the looks of things the super-tights fit him well (although Daily Billboard is still saddened that they've done away with the iconic underpants over the tights look). 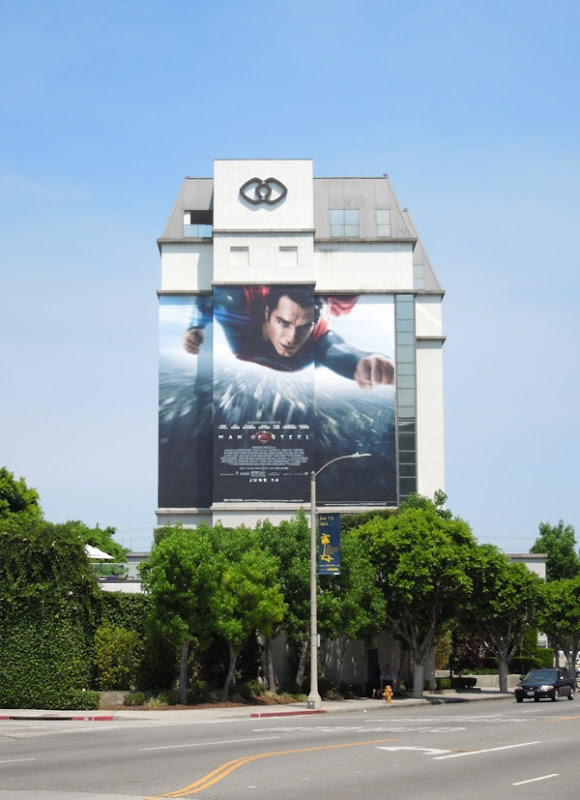 Whereas Marvel has seen massive success with its solo and team superhero movies, aside from Batman, DC has struggled and stumbled to bring its characters to the big screen in recent years. 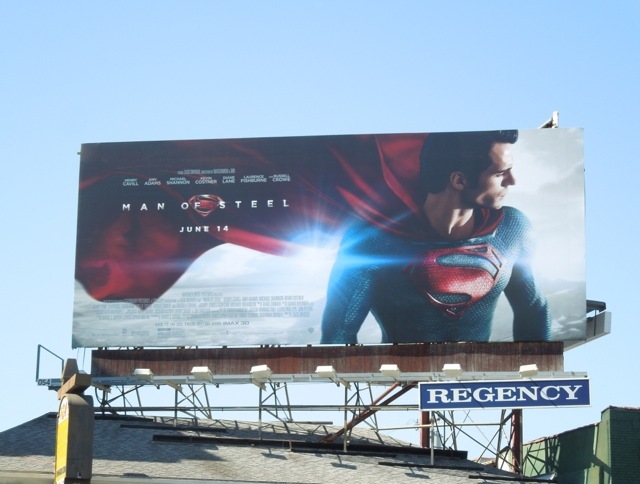 Superman Returns was a bit of a dud and lacked any real action, whilst Green Lantern was a CGI nightmare. 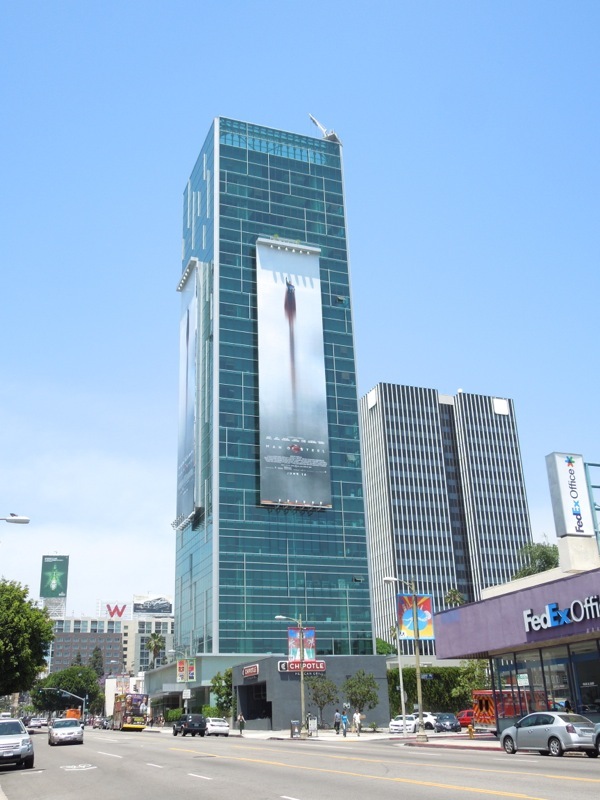 And on the small screen even though Arrow has been well received, he's living in a world devoid of super-powered heroes. 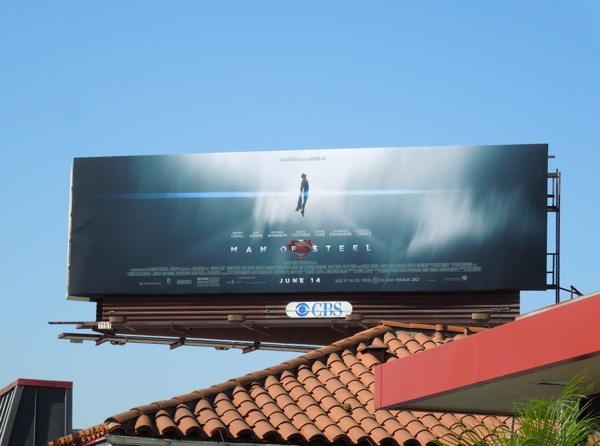 Daily Billboard was initially sceptical with the 'darkening' of Superman, worrying that Christopher's Nolan take of The Dark Knight may influence the brightly garbed hero negatively. 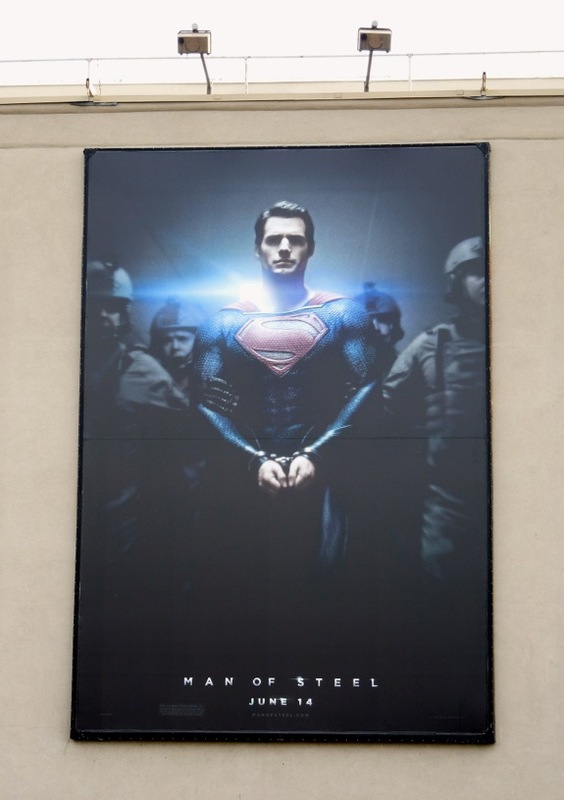 But having seen more of the footage from director Zack Snyder's film this could be the Summer blockbuster to beat (better watch your back Iron Man). 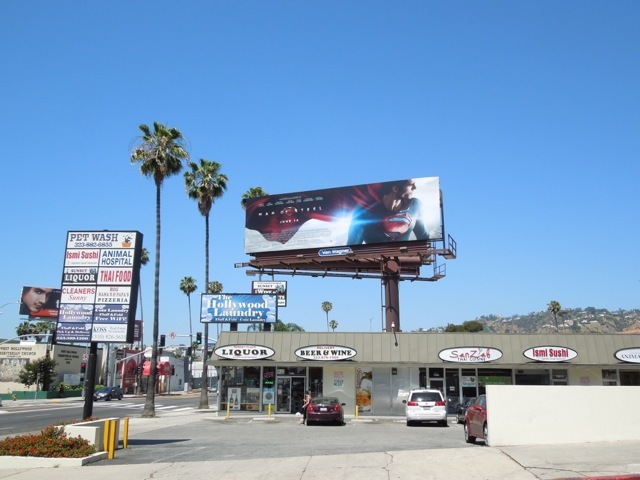 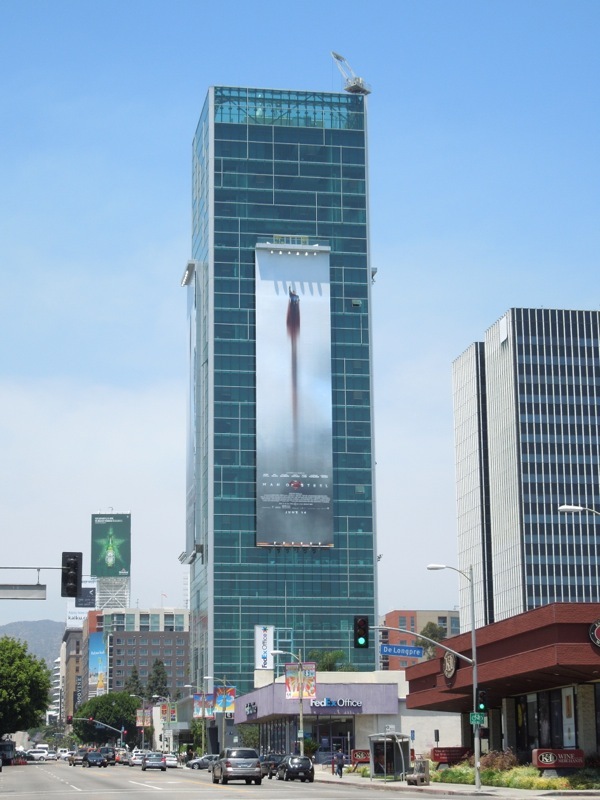 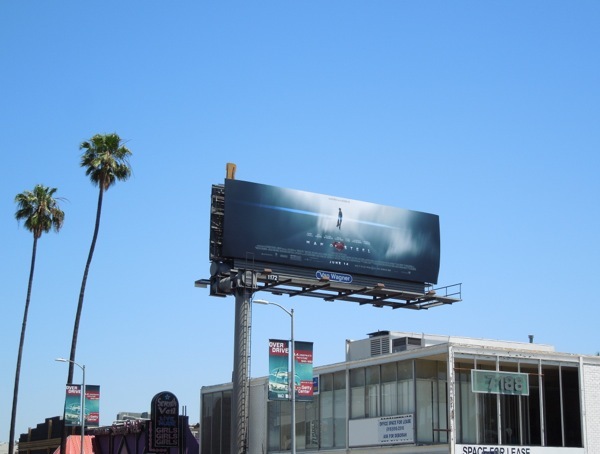 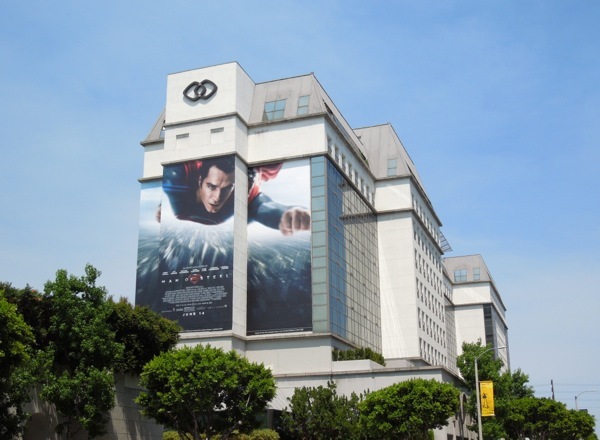 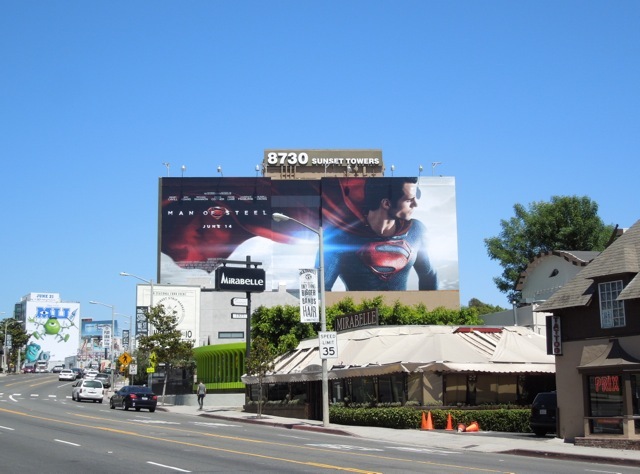 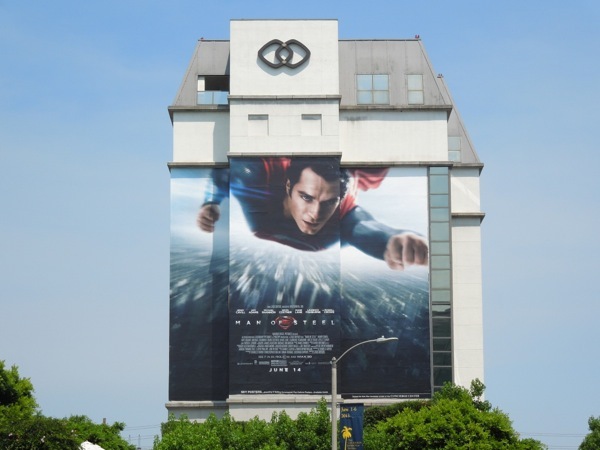 The cuffed Superman teaser billboard for the movie was first spied at Warner Bros. Studios in Burbank on February 2, whilst the flowing cape version was snapped along Sunset Boulevard on May 13, 2013 and the onslaught of other creatives, super-sized and standard size, quickly followed. 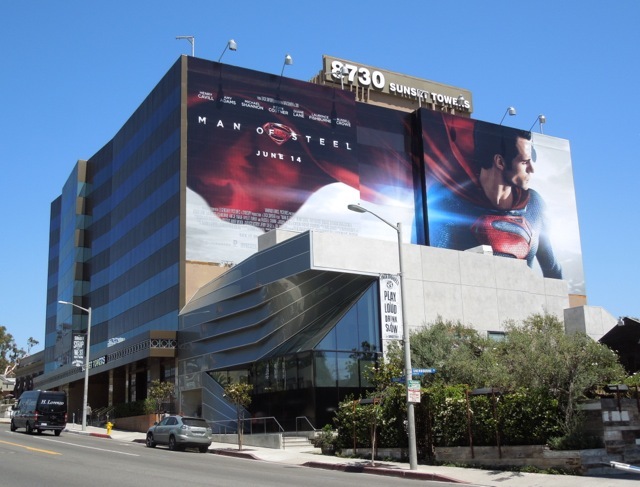 UPDATED: If you're a fan of the movie, be sure to click through and check out Henry Cavill's Superman costume from Man of Steel on display. 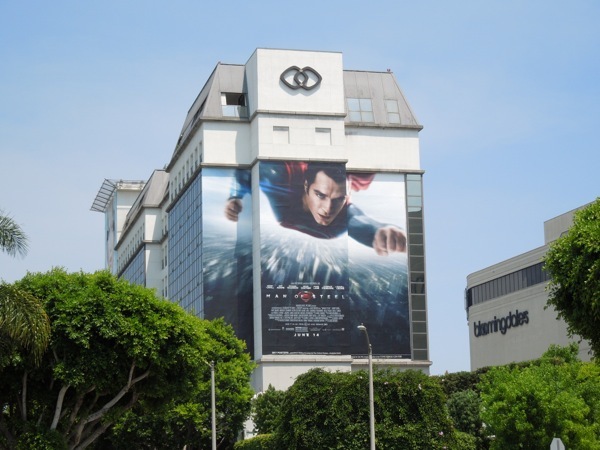 UPDATED: Here's one final ad creative for the movie which features Superman's iconic 'S' emblem, which we now know is Kal-El's house sigil on Krypton and stands for 'Hope'. 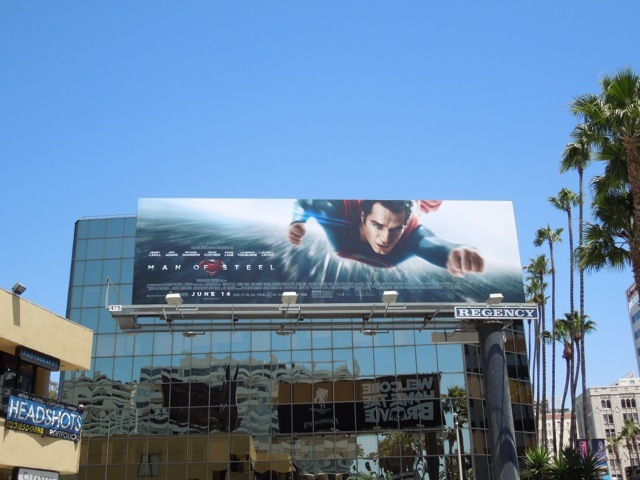 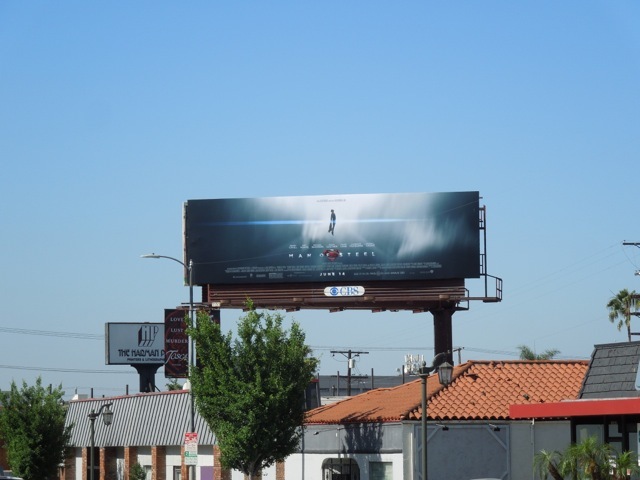 This supercool billboard was spotted at Warner Bros. Studios in Burbank, California on July 3, 2013.